Promising daughter of Gnýr frá Árgerði (8.02) and Evelyn frá Litla-Garði (8.19). Elding frá Heimahaga is a promising mare, daughter of Gnýr frá Árgerði (8.02) and Evelyn frá Litla-Garði (8.19). Elding was born on the 11th of July. First price five gated stallion. He is a compatition horse both in five gate and in A-class. Last fall Gnýr received 8,63 in A-class. Gnýr is son of Týr frá Árgerði and Gná frá Árgerði. Evelyn frá Litla-Garði (8.19) is a high class four gaited competition mare with 8.35 for Conformation and 8.08 for Riding Abilities; 9 for tölt, 9 for trot, 8 for gallop, 8.5 for spitit, 9 for general impression and 7.5 for walk. Total 8.19. Evelyn has also 8.5 for slow tölt and 8 for canter. In B-Class (four gate) Everlyn has received 8.36 in preliminaries and 8.56 in finals. Evelyn frá Litla-Garði is daughter of Hrymur frá Hofi (8.20) and Elva frá Árgerði (7.94). 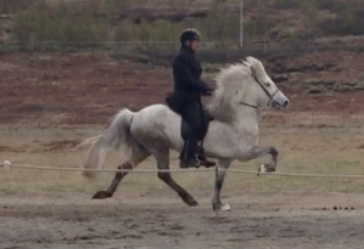 Hrymur frá Hofi (8.20) is a four gaited stallion and has 8.16 for Conformation and 8.23 for Riding Abilities; 9 for tölt, 9 for trot, 9 for gallop, 8.5 for spirit, 9 for general impression and 6.5 for walk. Total 8.20. Hrymur has also 8.5 for slow tölt and 7.5 for canter. 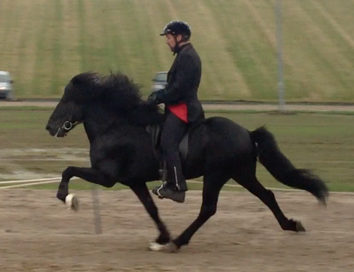 Elva frá Árgerði (7.94) is a four gaited mare with first price for conformation. Elva has 8.02 for Conformation and 7.83 for Riding Abilities; 8.5 for tölt, 8.5 for trot, 8 for gallop, 8 for temperament, 8 for character and 8.5 for general impression. Total 7.94. The first photos of Elding frá Heimahaga, taken on her date of birth, 11th of July.